. إن فندق هيلتون أديلايد حريص على توفير الراحة للنزلاء، فلا يوفر الموظفون جهداً في تقديم أفضل الخدمات وضمان حسن الاستقبال. يقدم الفندق فرصة للاستمتاع بشريحة واسعة من الخدمات بما فيها: خدمة الغرف على مدار الساعة, مكتب الاستقبال على مدار الساعة, مرافق مخصصة لذوي الاحتياجات الخاصة, تسجيل وصول/خروج سريع, تخزين الأمتعة . في الفندق غرف نوم يتجاوز عددها 374، كلها مجهزة بعناية وجمال وبعضها مزود بـ تلفزيون بشاشة مسطحة, بياضات, مناشف, حوض الاسترخاء, غرف لغير المدخنين. يقدم الفندق خدمات رائعة كمثل حوض استحمام ساخن, مركز للياقة البدنية, ملعب تنس لمساعدتك على الاسترخاء بعد نهار طويل من النشاط والتجوال في المدينة. إن فندق هيلتون أديلايد هو خيارك لخدمة الفنادق الراقية في أديليد. تتوافر خدمة انتظار السيارات لقاء رسوم إضافية بقيمة 34 دولارًا أمريكيًا. تتوافر خدمة الصف الذاتي للسيارات (خارج موقع الفندق) لقاء رسوم إضافية بقيمة 20 دولارًا أمريكيًا. Hilton was the perfect location for our stay the tram at the door step the shops just down the road and champas at breakfast was all to amazing. Toasties over priced and not that toasted.. and needed free to air tv. Other wise a great stay and look forward to the next mini break!. Close (walking distance) to markets, transport, restaurants, shopping & parks. The only thing is parking is a problem. 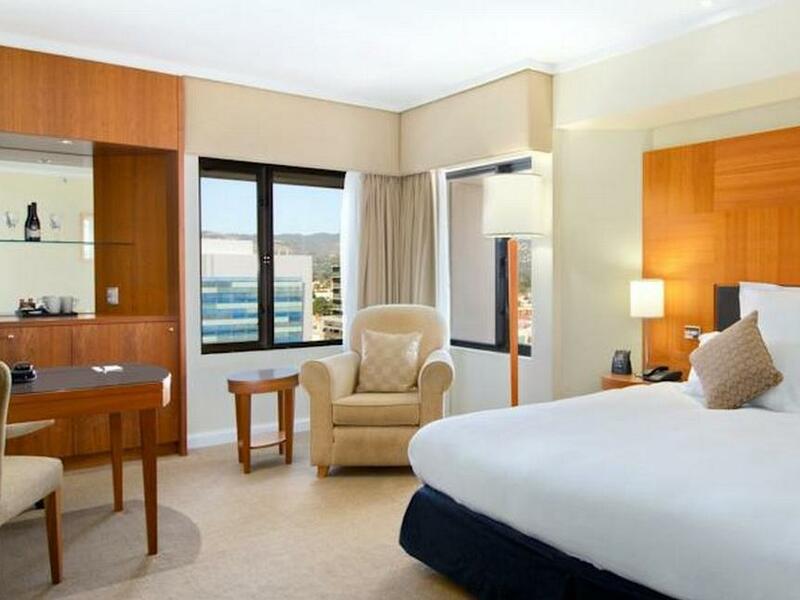 $21/day drive to a seperate multistory carpark (discounted for Hilton) or $38/day valet parking. Unfortunately there is no local parking at the Hilton. Dump your hire car before you get there if you can. Our stay here was excellent. Our first night had a little trouble with the aircon being noisy but was fixed the next day with no fuss. The food was good just a little over priced but thats the hilton for you considering there are great restaurants around. Location is great near market, chinatown and coles. Rundle street is about a 10min walk and about 15,20min walk to casino or $10 taxi ride. 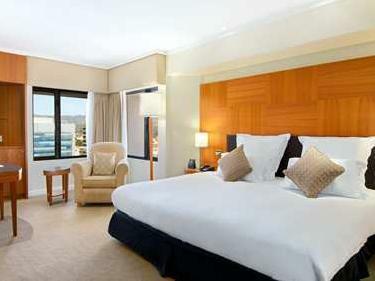 We enjoyed our stay in adelaide and the hilton added that comfortable stay for sleeping. We had a lovely stay, the rooms were clean and comfortable, service was great and we got free breakfast at check in! It's close to Chinatown and many restaurants around us. The only downside is that it's not right in the Centre of town, but not far from the main shopping/ entertainment district. The hotel is a bit old but not at all run down, still very comfortable. the location is very good. However, other experiences were not good. Firstly, when we check in, the staff asked us want to move to higher levels room, and didn’t let us know that will charge us 70 dollers two day. Secondly, we booked the breakfast, that was present 37dollers per person. But when we have breakfast, they told us if we want coffee that will charge 5 dollers per cup. And we booked two days accommodation, the first day from 9:35 am the room servic came the knock the door. And we said pls come back after 12pm, but they still came to knock the door 3 times before 12pm. Also lots of details I didn’t mention, that was the worst experience ever had. This hotel has been around for a long time in this location. The location is fabulous and the service also. Had breakfast, lunch and dinner at Coal which adjoins the hotel and it was excellent. 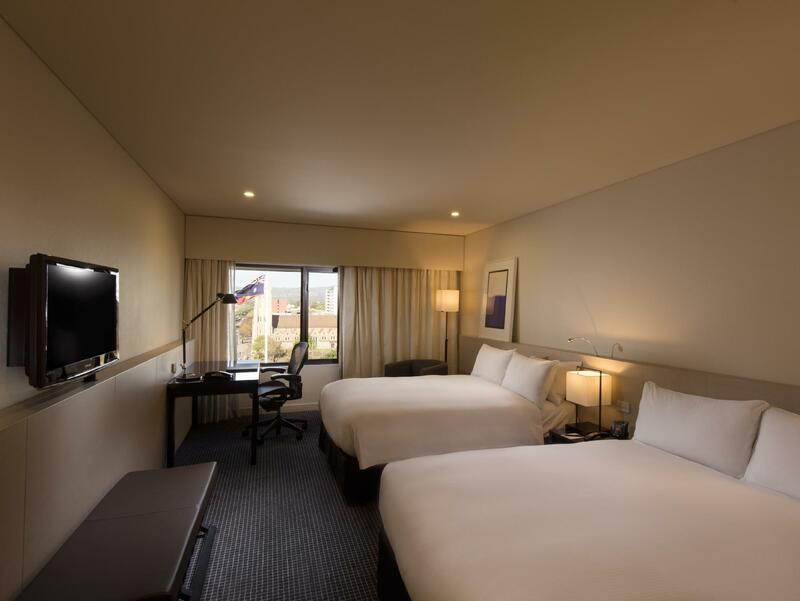 If they do a few little upgrades like replace the ageing pool beds, the old fridges in the room - and maybe a few cosmetic touches then it will be up to scratch with their competitors. All round very enjoyable short stay. Upon arrival, I discovered they have checked someone else into my room. It took 30 mins to fix, and I was told I was being upgraded to a better room on a higher floor. The original room was on the 18th floor and the new one was on the 16th, right next to the bar and lift - clearly the room kept vacant for mix ups like this. The shower was also faulty in this room. The valet completely ignored me for about 20 mins after the check in incident, and was downright rude when he did finally attend to me. Will never stay at a Hilton again, truly horrendous service. A property that is in the middle of upgrading. Gym pool and sauna were from yester-year. Room was ok, exec lounge ok, staff good, but then the breakfast in the gleaming ground floor restaurant was fantastic. Room service food was also top notch. Best omelette I have ever had. 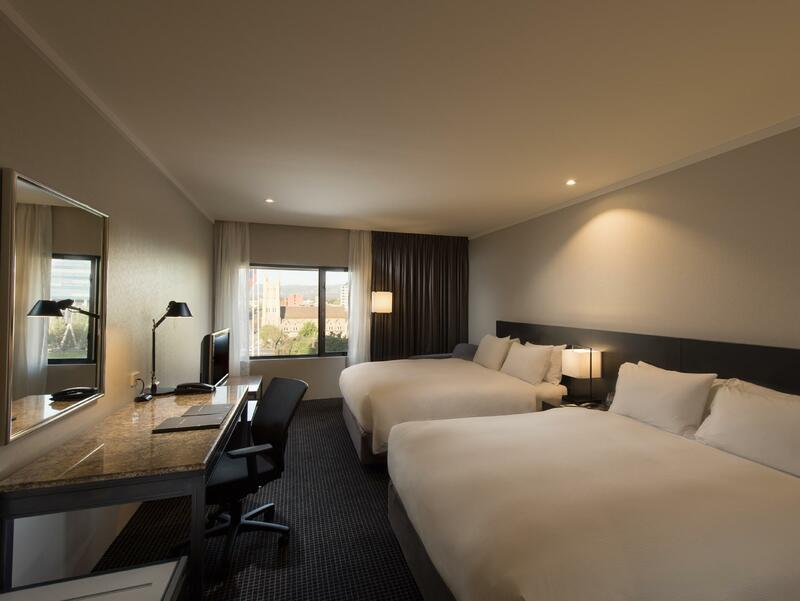 We keep going back to the Adelaide Hilton because it is just so damn conveniently positioned, close to great restaurants, walking distance to the main shopping streets and the tram out the front. The main negative here for us is 1st and foremost the Lobby bar area; It is so damn cold in winter that it is uncomfortable without your jacket on.................there are entrances on adjacent walls that the cold wind streams through. I was also disappointed this time by the hanging space in the room; if there are 2 of you and you are there for more than a few days the wardrobe space is very limiting. The staff are by and large friendly and helpful although when we arrived there was not a concierge in sight and we lugged our own suitcases in. The staff in the Exec Lounge were really helpful, especially I as seemed to visit every time they were cleaning the coffee machine. Good enough to go back to but not sensational. The hotel is located next to china town, there are a lot of restaurants in the area, tram stop is just in front of the hotel. Parking is a little bit diffecult so you might need to have a valet parking. The room is normal, nothing is special. Blanket is very thin. Tempereature in the bedroom can only set to 25c max. The hotel is very busy on Friday night and you can hear the noice from outside the street. 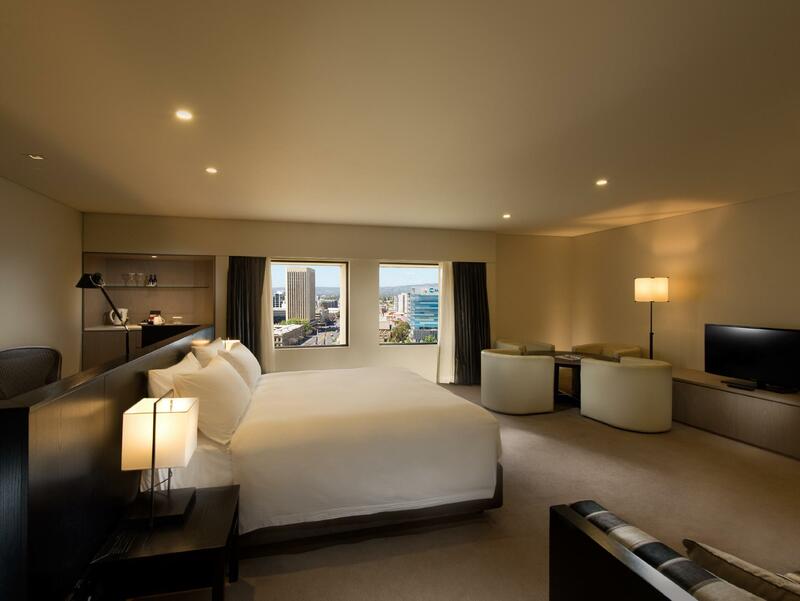 Hotel is very convenient, near to central market, China town and a lot of good restaurants nearby , and just across the road is the free tram rides to the city center. Only set back is there is no sitting ares at the Lobby, and the hot tub temperature is not hot enough, while the sauna benches really need to be replaced. Room service food was very average. Could hear every sound in the hall, doors slamming, people coming and going well after 1am. Maybe people staying on business could be put a distance from families on holiday. 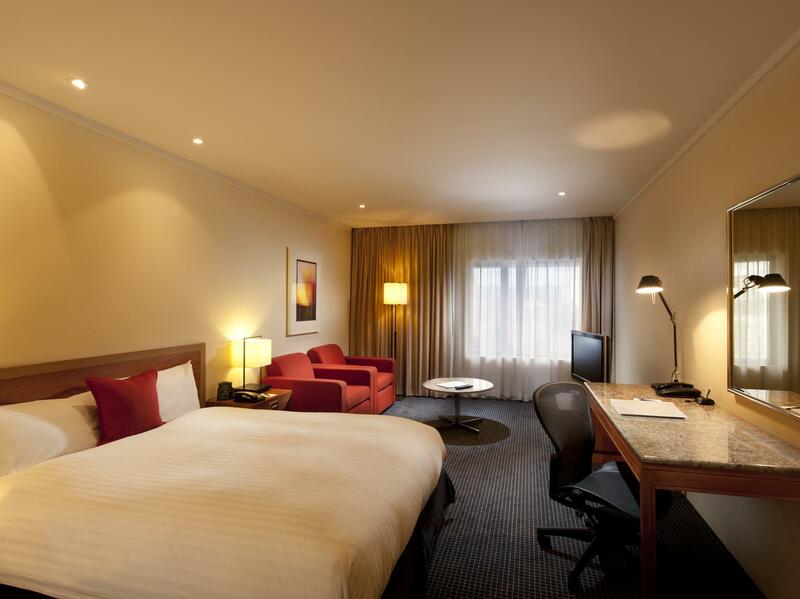 The location is great as you're less than 10 min walk away from major attractions within the CBD. It is a hilton so the rooms were clean and lobby was nice with friendly staff. However, the tennis court/"running track" which isn't really a running track at all / gym / pool all need a serious upgrade. I was told by the hotel staff that it is due for an upgrade soon.